When I got out of a meeting at work around 4:45, the sky was still mostly clear. Thinking storms would not fire before dark, I went as planned to a retirement party at an Edwardsville restaurant, planning to stay until around 6:00 p.m. Unbeknownst to me, a severe thunderstorm watch was in effect, as updated in this mesoscale discussion from SPC. 5:50-6:10 p.m. - Leaving the restaurant, I immediately see an E-W broken line of thunderstorms to my north. When I get home around 6, I check the radar and see storms in N Macoupin and Green Counties on radar; two strongest cells, both severe-warned, are in N/NE Macoupin Co. and N Greene Co. (warning text here). The Greene Co. storm is at the west end of the line, and appears strongest. I check the storm-relative velocity scan for rotation, and it definitely shows rotation in Eastern Green Co, on S flank of storm. A smaller, weaker storm is just E or NE of Alton, and other scattered storms are on MO side W and SW of STL. Hereafter, I will call this the "Alton storm." 6:15 After a quick decision to chase, we're out the door - my wife Alice joins me for the chase. Immediately we see the Alton storm, which looks strong but slightly elevated. We plan to cross ahead of it on I-55, then cut west at Litchfield or at the next exit toward Carlinville. The "Alton" storm seemed to be kind of keeping up with us as we headed NNE on 55 - it was harder to get around this storm than I expected. 6:45 It's evident with the storms now apparently moving somewhat southeast rather than due east, and the west end of line (the location of "Greene Co." storm) just N of due west, that we need to cut west at Litchfield. By now, a SVR warning has been issued for Macoupin County, which we enter almost immediately upon turning west from Litchfield. As indicated by this statement, the storm has produced nickel-sized hail in Greene Co.
6:55 Driving west from the Litchfield exit, we Look at ragged base to our N; there is a low scuddy outflow feature at east end of base, and at the west end we see striations and a rounded, slightly lowered meso-looking feature, with intense precip behind it. Around this time we notice an apparent intensification of the inflow band to the east. This may have been the beginning of a beavertail we would observe shortly later. At this time, we bail back east as we are being overswept by precip coming from W - we see very dense precip less than ½ mile away. Just after 7:00 - Looking to NNW as we retreat, we a see rapid increase in the organization of the meso. 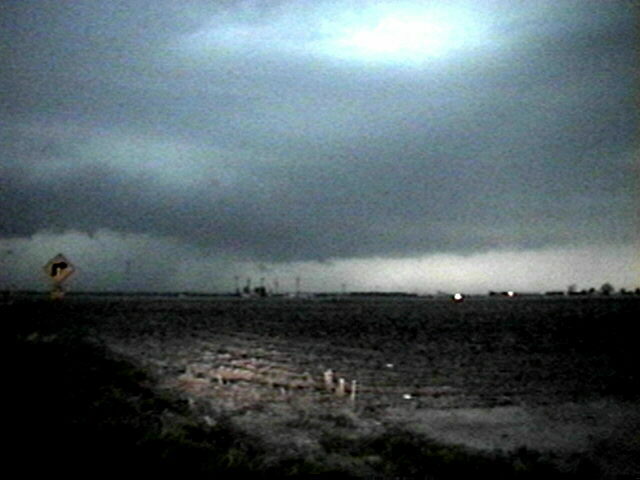 A distinct beavertail is now visible, and inverted pyramid-shaped lowering forms under meso. In traffic and increasing precip; we could not stop to video. I wish I could have; the combination of the lowering and the beavertail looked like something straight out of Oklahoma! This lowering, likely a little E or ESE of Carlinville, wraps in rain and becomes obscured within 1-2 minutes. 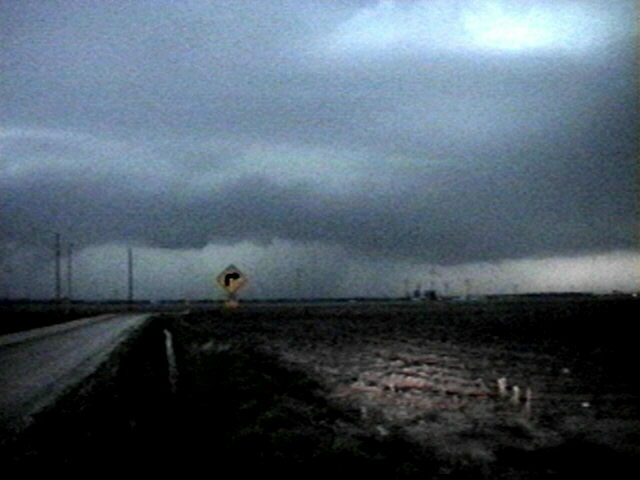 Scott Kampas was also on this storm and saw these same features. 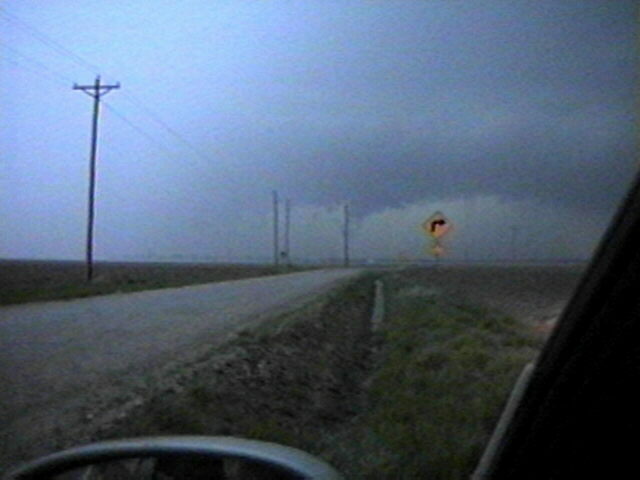 In fact, he reports that the storm had a wall cloud of varying sizes for about 25 minutes. Later reports indicate wind damage just east of Carlinville around this time, and reports also trickled in of earlier wind damage west of Carlinville. Thus, both large hail and damaging wind occurred from this storm along a line from about 6 miles W of Carlinville to 3 miles E of Carlinville. 7:10 We seek shelter under the roof at Litchfield gas station. We experience intense SSW then S wind, accompanied by heavy rain, maybe a little hail. After a few minutes, the wind goes calm, then it blows from N, as heavy rain continues. Somewhere around this time, the power goes out, and stays out the remainder of the time we stay at this location. 7:20 A SVR warning is issued for Montgomery Co, as a storm reported with high wind is approaching Litchfield. We see another storm coming after maybe 5 minutes of calm and light rain at most. 7:30-7:45 We wait out intense rain and WNW wind with some small hail. 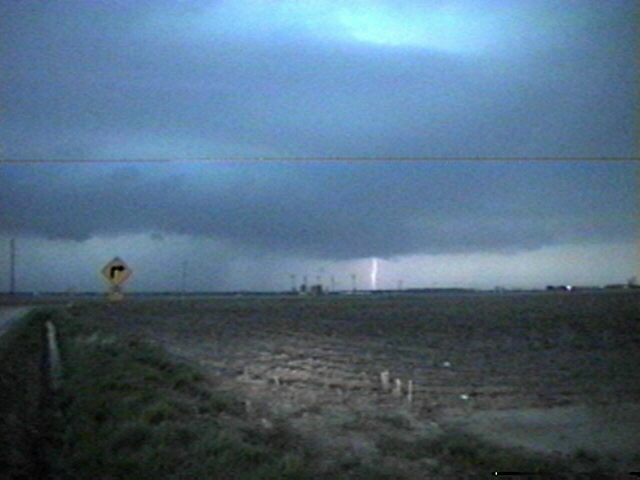 The storm abates around 7:45, and we leave and head S on I-55, only to run into it again and stop at Benld exit around 7:50. We hear a TOR warning for north St. Louis Co., MO and western Madison Co., IL We wait it out a while; when it lightens shortly after 8 we head south to cross ahead of tornadic storm. We figure this is safe because we hear a statement indicating the that possible tornado's motion has slowed and it has yet to cross the Mississippi River. We get home around 8:30. By this time the tornado-warned storm has weakened, and the warning is allowed to expire. Some thoughts - After repeatedly reviewing radar loops, I think I have a better understanding of what was going on. The main precip area of the storm we were on was moving SE, but the reports of large hail and wind damage are along a line that is much more west to east, along a line passing about through Carlinville. This would closely parallel the likely path of the meso based on what we observed and what I could surmise from the radar. It seemed to move to the E or ESE along the leading edge of the storm, as might be characteristic of a storm with HP characteristics. Most of the hail fell very close to this path, and the wind damage did too - perhaps associated with a wet RFD behind the area of rotation int he storm. The storm seemed to split as the "Alton" storm (a "left mover" compared to all the others) swept through from the southwest, with the dissipating meso and part of the precipitation area passing just north of Litchfield and being absorbed by the "Alton" storm. That may explain the wind shift we experienced, as the outflow from the "Alton" storm interacted with the dying meso passing north of Litchfield. In any case, the rain-cooled air from the "Alton" storm quickly stifled the inflow to the storm, and lost whatever rotation it had left, and in fact became more outflow-dominant and linear as the heaviest precipitation area shifted to the area southwest of Litchfield. The last severe report from this storm was wind damage 3 miles NE of Gillespie, not too far SW of where we had been viewing the storm before being forced to retreat. From here on, these storms became basically massive rain-producers, with much of the Macoupin Co. area getting 2 - 3 inches of rain. Local storm reports from this storm and others in the area can be seen here. A radar image of the storms from just after 7 p.m. can be seen here. Reports of hail and wind came from central Macoupin Co. around this time. The "Alton storm" is on the Macoupin Montgomery Co. line, just SE of the larger storm in Macoupin Co. that was responsible for most of the severe reports. Total chase distance - about 80 miles.